When candidates ignore your emails and calls, there’s another option: send a text! 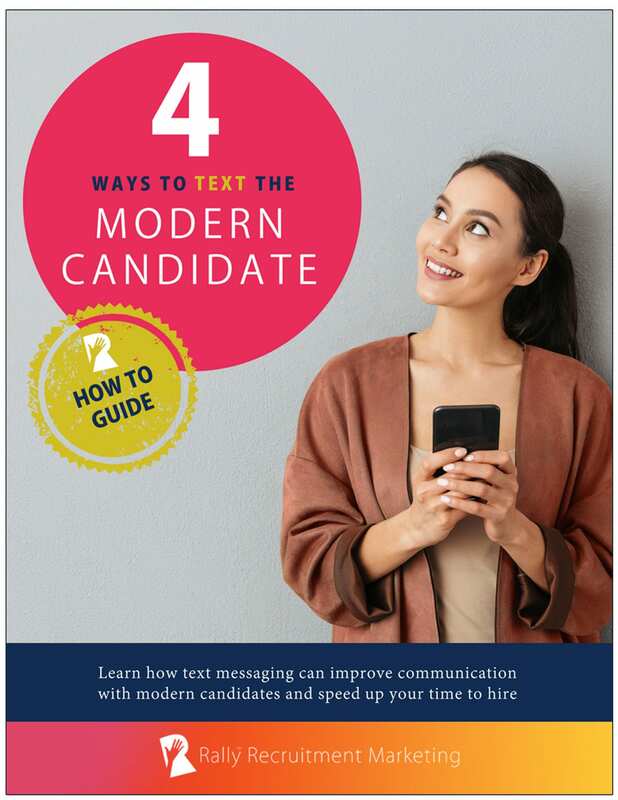 Learn 4 ways that text messaging can help you increase response rates and help you communicate better with modern candidates throughout the candidate experience. Features great examples from talent acquisition teams that are using texting to attract, engage, nurture and convert candidates faster in their recruiting funnel. There’s a new expectation from candidates: speed. They’re holding employer brands to the same standard as consumer brands: to be always on and easily accessible. In today’s competitive job market, time to respond is now the difference in time to hire. That demand for speed is placing a new priority on candidate communications. The content of what we communicate will always be important to our Employer Branding and Recruitment Marketing strategies. Now, we must also look at how and when we communicate during the candidate experience. There are more ways than ever to communicate with today’s socially engaged and digitally connected candidates—such as email, LinkedIn, social media, messaging apps, website chat bots and mobile texting. All of these should be in your candidate communication toolbox. But there’s one communication technology in particular that meets candidates’ expectations for immediate access to employers, and meets recruiters’ needs for response rates from candidates. That technology is text messaging. Sponsored by TextRecruit, this Guide features examples from thredUP, Defenders, Trilogy Health Services and Allan Myers. The examples can work for all company sizes, all industries and all Recruitment Marketing budgets. Get ready to be inspired to improve how you communicate with modern candidates and gain the competitive advantage of speed. Download your copy of the Rally How To Guide today. TextRecruit is a sponsor of Rally. Their sponsorship fee helps us to create educational content and events on Recruitment Marketing.